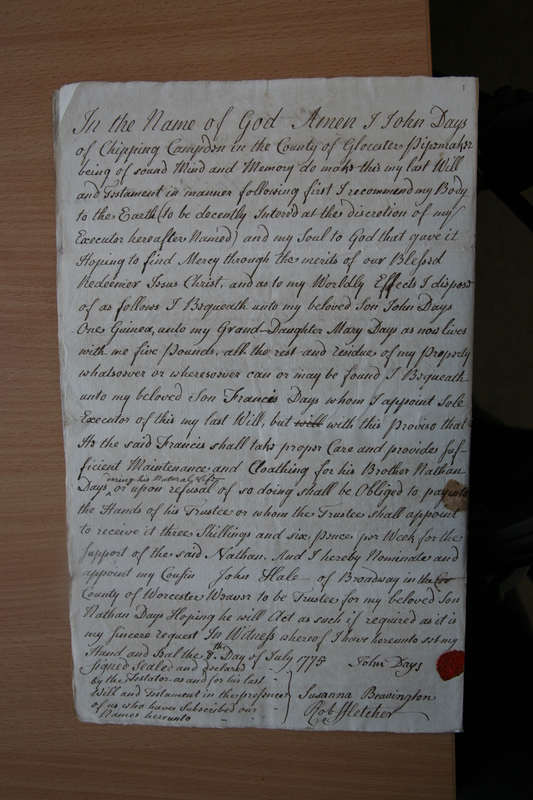 A group of CCHS volunteers has taken on the task of transcribing all the Wills, Letters of Administration and Probate information of people living in Campden and surrounding areas, nearly 1000 of which are stored at Gloucestershire Archives. Two of our members are expert at reading the writing from the 1500’s and 1600’s while the rest of us struggle with the later years. A database is being developed which will enable researchers to make links with other sources of information. The documents have been photographed with a digital camera and each volunteer has taken responsibility for transcribing them into easily readable documents which can be accessed by researchers. Wills give a small insight into the lives of local people. Unfortunately the location of land and buildings are rarely identified so it is not often possible to link a family with a particular property but the bequests to individual people can throw up delightful personal touches and sometimes intriguing family disagreements! This will is fascinating for the insight it gives into practices and beliefs of Methodists in the early nineteenth century. Download a transcription of the whole will below. Many thanks for your wonderful work. I have just discovered that Francis Days , son of this John Days, was my 5th great grandfather , and hence John my 6th! Very cool…. copies we receive. When did they transfer to being proved in London? A very minor point but some thoughts would maybe clear my mind! I agree with you Diana, they do not always follow the rules as we understand them. We have had a few [wills] where I could not see the logic of London v. Glos. Mary Ellis in 1829 was Prerogative Court of Canterbury (PCC) (and now stored at Kew) but no property outside the county. Now I have looked at National Archives website – there is so much background explanation there – and this is only a bit: Wills were proved by a number of courts. The only probate court records held by The National Archives are those of the PCC up to 1858. The PCC, which actually sat in London, was the senior church court, and dealt with the wills of relatively wealthy people living in the south of England and Wales; with the estates of people who died at sea or abroad leaving personal property in England or Wales. From 1653 to 1660, the PCC was the only court to deal with wills and administrations. So it seems it wasn’t necessarily for estates outside the county.